Hey hey! 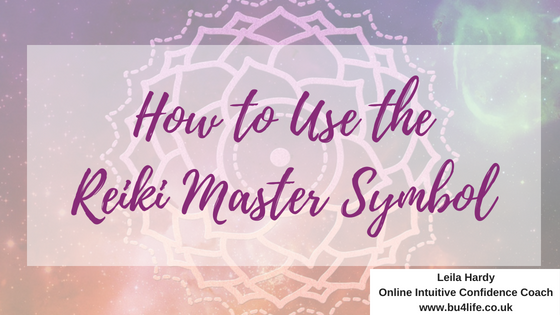 Welcome to this blog, all about using the Reiki Master symbol. Are you already attuned to use the Master symbol in Reiki? If you are Advanced level or above, then yes, you will be! If you are at Reiki Level I or II, then chances are, the Master symbol in Reiki may be new to you, but if you are ready to take your Reiki to the next level, then find out more about Advanced Reiki Techniques Training here, in which you will be attuned to use the Reiki Master symbol. For those of you who don’t know me yet, I am Leila Hardy, your online Intuitive Life and Business Coach. I love nothing more than supporting women who are empaths, intuitives, holistic healers and spiritually based coaches to fulfil their purposes with confidence and total belief in their abilities. Combining work with the subconscious mind and energy, I help others to identify and clear any obstacles that have been in the way of their ultimate health, wealth, happiness and success so they can be, do and have all they desire AND deserve! Becoming a Reiki Master and teacher has been a huge part of my personal and spiritual development journey and it’s a passion of mine to share the benefits of Reiki (both learning and receiving) with as many as I can, so feel free to share this blog once you have read it and enjoyed it! What is the Reiki Master Symbol? In addition to the sacred Reiki level II symbols you are attuned to as a Reiki student, the Master symbol is an additional symbol you can pull out of your toolbox as and when necessary; as a precursor to the other symbols, or as a standalone symbol that brings additional Reiki energy and healing through when activated. If you are not sure what an attunement is, head over here to have a read up! Depending on which method of Reiki you use, you may have a couple of Master symbols to use as part of your toolkit! What can having the Reiki Master symbols do for you? When you are attuned to Reiki Level I & II as a healer, you gain some powerful tools to be able to use to heal yourself and your clients, but when you gain the REIKI MASTER SYMBOLS, those tools become amplified and their power increases further! How would it feel for you to have crazy manifesting abilities, total confidence and faith in your intuition and rock your meditations and those you take your clients through?! The Master symbol sure is a powerhouse of energy that will support you and your clients in the most fantastic ways! Do you already use it? Let me know in the comments!